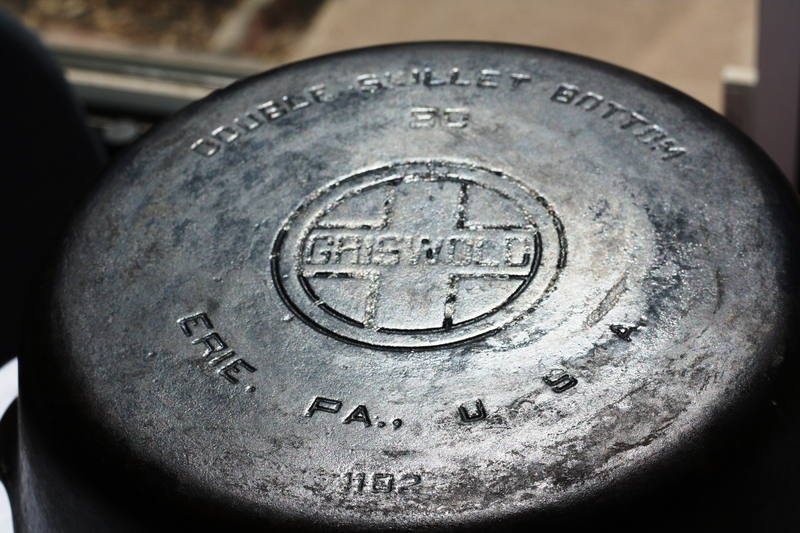 This pot is a Griswold Double Hinged Skillet. (Looks like he’s smiling for the camera doesn’t it?) He was picked up at Goodwill for $30, apparently that’s a pretty good deal on a skillet from this maker. Honestly, I’m not the one who picks this sort of thing up. Bubba is the cook of casa de yellow so he’s usually the one on the look out for this sort of thing. According to this site our skillet could be from 1940’s or later. And apparently, it’s not considered “good” metal since the Griswold is not in italic letters. 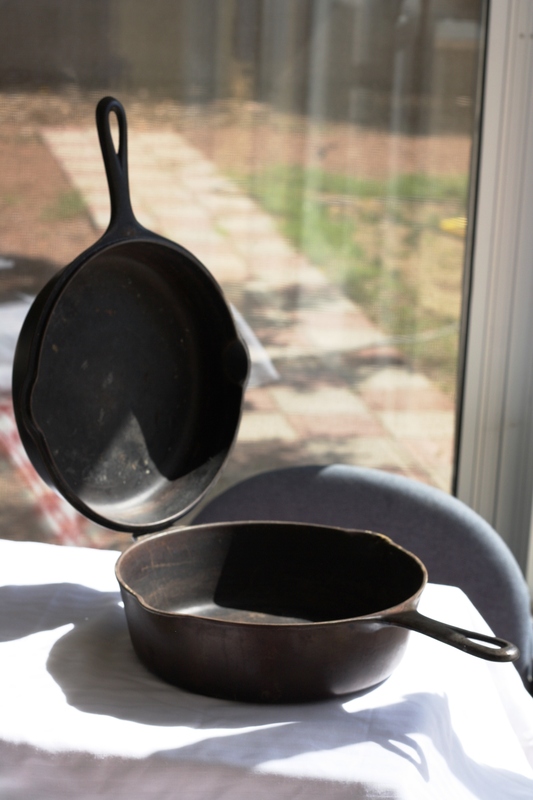 After 1940, diminished metal was used to make cast iron pots, and Griswold stopped italicizing it’s name within the cross after that point. 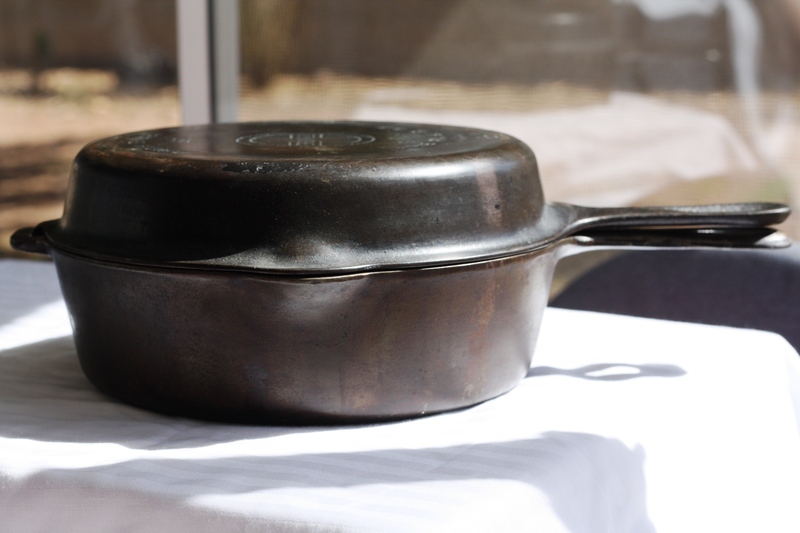 But again, I’m not an expert on cast iron, I just like old stuff and history. This little skillet wasn’t purchased for it’s monetary value, it was merely purchased for it’s unique quality. See, it opens, and there’s not a lot of wear and tear on it. So, it must not have been used very often. This booger is pretty heavy too, so that might explain the lack of use. Or the original owner could have been a non-cooking April and only depended on microwave dinners and Lucky Charms to get by. Really, I have a hard time remembering how to turn the stove on. My mother thinks it’s hilarious, my Bubba not so much. I never would have made it in the times before microwave technology, and when the women were expected to cook. My family definitely would have starved! Well, I’m off to root around the kitchen for some Lucky Charms or maybe if I give Bubba the sweet eye he’ll make me some dinner.